Ease Leads to Exposure. Exposure Leads to Adoption. If you're looking for some inspiration this week, check out the ESIP Interview Making Data Matter with Tina Lee or listen in to It's Not Data Science, It's Just Science, an #AGU100 StoryCorps podcast with Esri's Dawn Wright and RPI's Mark Parsons. ESIP is home to 30+ vibrant and diverse community-driven collaboration areas (clusters, committees, & working groups) centered on addressing Earth science data challenges and opportunities. In the second webinar in our series, “Data in Action: Increasing the Use and Value of Earth Science Data and Information,” several ESIP collaboration areas will share lightning presentations about their recent activities and efforts to increase the use and value of Earth Science data. This webinar aims to broaden awareness of ESIP collaboration area activities, increase communication and collaboration between existing collaboration areas, and invite new participants to join. Please join us if you can! For more details, including connection info, see here. To celebrate ESIP's 20+ year existence, Arika Virapongse interviewed ESIP community members on their perspectives on progress toward making Earth science data matter over the last 20+ years. The interview with Tina Lee is the third in a series of interviews that will be released over the next year. Read the interview here. If you would like to share your perspective, let us know at staff@esipfed.org. 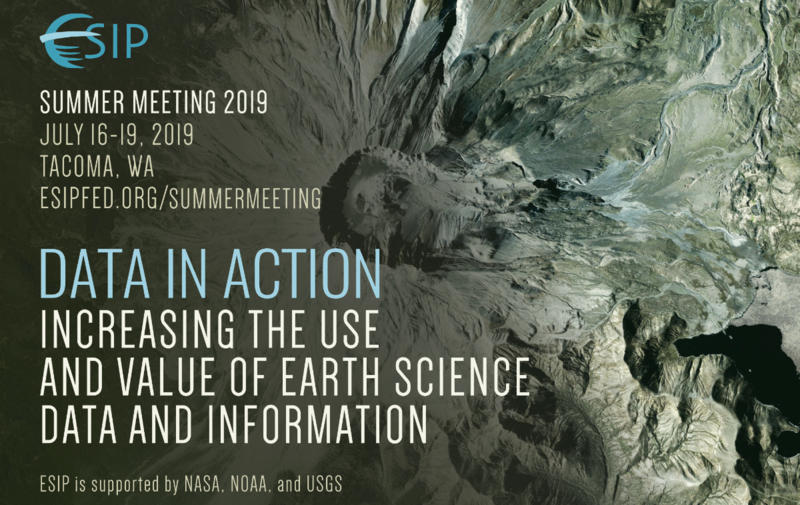 The EarthCube community extends a special invitation to the geoscience community to participate in the 2019 EarthCube Annual Meeting in Denver, CO, June 12-14, 2019. The deadline to submit abstracts has been extended to 4/19. EarthCube welcomes presentations about research enabled by the use of advanced cyberinfrastructure and about new computational capabilities that enable and support geoscience. Submit Abstracts Here. The 4th Gateways Annual Conference, which will be hosted Sept 23-25, 2019 in San Diego, CA, is an opportunity for gateway creators and enthusiasts to learn, share, connect, and shape the future of gateways. Gateways are user-friendly interfaces to scientific computing, data, and other domain-specific resources to support research and education. This year's conference is co-located with the eScience conference. It will feature hands-on tutorials, demos, keynotes, presentations, panels, posters, and more. Submissions of papers, demos, tutorials, and panels are now being accepted. To learn more and submit, see here. Esri's Dawn Wright and RPI's Mark Parsons were recently featured in a #AGU100 StoryCorps podcast, where they each shared their journeys into data mapping, and how the field has grown, including at AGU. Listen in here. The NASA Frontier Development Lab (FDL), hosted by the SETI Institute, is an interdisciplinary research accelerator that combines talented researchers in AI with domain specialist researchers at the PhD and Postdoc level. FDL is looking for talented researchers with interest and capacity in several challenge areas for a 2019 research sprint. Places are open for both Researchers and Mentors, who receive a stipend and accommodation at NASA Ames in Silicon Valley for eight weeks, 6/24/2019-8/16/2019. See the challenge areas and apply here.